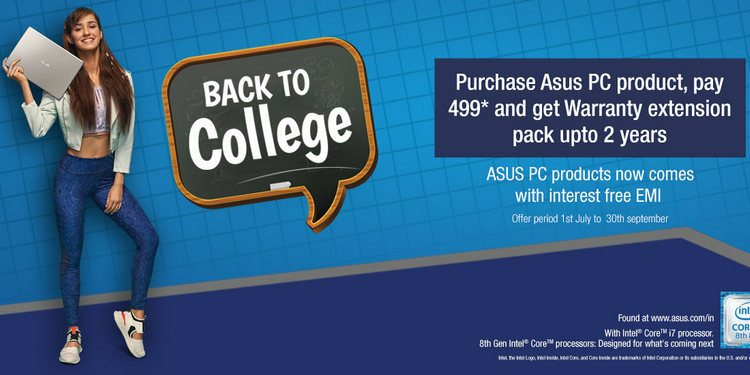 Asus is offering Extended Warranty, Zero Cost EMIs, and personalized goodies to customers as part of its new ‘Back to College’ promo announced this week. The offer is currently only valid on the company’s notebook range, and not on its smartphones. As for the additional warranty, there are two different offers available – buyers can opt for the warranty extension pack of up to two years by paying Rs. 499 for regular laptops and Rs. 999 for ROG-series devices. They are also eligible to buy the ‘Up to 3 Year’ extended warranty pack with Rs. 999 for standard laptops and Rs. 1,499 for gaming devices. Do note that customers will have register on a specially-created site to be eligible for the offer. Alongside extended warranty, Asus is also offering no-cost EMI options to its buyers by tying up with Bajaj Finance. Here too, there are multiple offers for buyers, including a 9 by 3 scheme and an 18 by 6 option. While the former is applicable on all PC and notebook models across most supporting retailers, the latter is only being offered on ZenBooks and ROG-series models. The 9 by 3 scheme levies 0 percent interest when users pay three EMIs as down payment and the remaining amount in six equal EMIs. As for the 18 by 6 scheme, it lets customers pay six EMIs as down payment and the remaining amount in 12 equal EMIs, but can only be availed through Asus exclusive stores. Last, but definitely not the least, the Taiwanese company is also offering customized ROG T-shirts to buyers of ROG gaming laptops. The ROG t-shirts will have the customer’s name printed at the back, and will be shipped within one month of the customer filling in all the requisite info by registering on the company’s official promo site. The offer will be live till September 30.